Citizenship, cereal and a tooth! I love being a Canadian. I love being part of a country that can end any sentence in "eh" , and that says the word about like aboot . I would also love for Cailyn to finally be recognized as a Canadian citizen!! The process is simple, just it seems to take a very long time to actually receive the final judgements. Yesterday we received a letter about her citizenship application stating that is now in the hands of the Program Support Unit, thus, causing a delay in finalizing. Hmm... she is a citizen by descent, yet we have to go through all the hurdles to have actual recognition. It is a little frustrating as we cannot get her a Social Insurance Number until this is finalized, and without a SIN number we cannot open a proper education savings account. On the contrary, the government has approved us for the Universal Child Care Benefit where we get a pittance every month to assist with our child care needs and we received our first cheque yesterday, retro active to her birth. This is very impressive to us and we are grateful to have it! The UCCB did have some challenges as they followed upon our application asking for proof of Cailyns refugee status etc... which was comical to us. We were able to satisfy their needs quickly with our Indian birth certificate, and 2.5 months later, we received our first cheque. This little Canadian girl has a tooth now, yep, lower right chomper has made an appearance! Feeling the tooth on day one was like feeling the tip of a razor blade, or the sharp point of a sewing needle. She is obsessed with this tooth, sucking on it and touching it all day. It is adorable to watch her recognize that something is different in her mouth. We also started her (a little early) on rice cereal. We started earlier than planned to see if this would help with her intestinal trials, and luckily it has!! Cailyn LOVES to eat her cereal and the sheer excitement of sitting in her high chair waiting and watching as the cereal gets made causes her to either squeal or coo with delight. As a result of a few days of cereal, she has actually worn the same outfit for more than one hour and her laundry basket is quite empty! Yesterday she wore the same outfit for the entire day, what a change for us! YAY for solids! The Liebster award - wow! Seems there is a series of Liebster Awards being mentioned on blogs, all started by Doug and Bill , and then we were mentioned in the awards list by Douglas and Chad . We feel quite honoured to have been mentioned and understand that we must pay it forward as a grateful recipient. Now, this feels a bit like Survivor to me, that we have won the reward challenge on day 29 and get to choose one person to come and eat with us, leaving the rest behind. 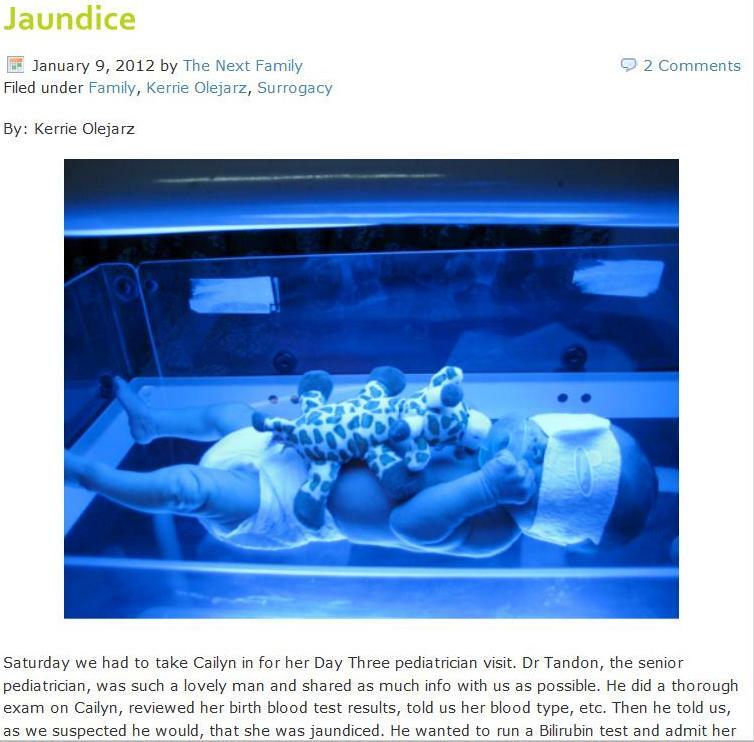 We enjoy so many blogs about surrogacy, that it is difficult to highlight just a few! Made in India - two beautiful boys born after some drama in Mumbai. Nik and Lisa have become friends, for life. We had many a beer with Nik while in Mumbai in the summer of 2009. Baby Masala - we had the pleasure to meet this family in Mumbai in 2009. If you go back in their blog to the beginnings, you will see a very heartfelt post about taking this plunge and the uncertainty that came with it. We love the updates on Micah, seeing him grow up into such a wonderful little boy. Procreated In India - we had the pleasure to meet this family while in Mumbai in 2009. They have a beautiful baby girl, and I hope that when they try for baby number two they continue to share their experiences! Amani and Bob's Indian Surrogacy - Amani and Bob - beautiful Tobias born in 2010! Meg and Bob had their own hurdles throughout the early parts of their journey, but pressed on to have success and now are expecting baby number two with SCI. Oh Mandy!!! We all hoping and praying that Mandy and her hubby Rick finally get the news they so desire. After I think 4 failed attempts in India, it is their time!! I just wanted to pay homage to some of our pioneers who have stayed in touch with us as we struggled through 8 attempts at a baby in India. There are just so many great blogs out there now that there is no way I can make a top ten list! Sometimes I worry our blog could scare the crap out of people - well our earlier mishaps and blunders anyway. I hear from people daily that our blog has inspired them, and for that we are grateful. And, this list would not be complete without mention of Dr Shivani's blog, and The Next Family. Both of these places are very special to me, and I feel like they have helped me grow my friends list beyond what I could have imagined. To access the blogs I mentioned just click on the name and you will be redirected. If you want to see an adorable video of a sweet little 3yr old girl trying chewing gum for the first time, click HERE. This angel belongs to Brandy at The Next Family. Seeing this video really makes me excited to see Cailyn try all these new things in life! The last week has been much improved here. The new formula seems to be doing the trick, but sadly, the ingredients are far from what I would feed her in a perfect world. I had such high hopes of an all organic formula, snacks etc, yet, the intestinal trials of one Cailyn Olejarz have pulled me far off this path of idealism. I am so over it...I try my best and will always make the best choices on her behalf. In this situation we need her to eat, spit up minimal, BURP and feel good, so, so .... so be it...its not organic and the ingredient declaration is far from ideal. Sometimes we have to compromise. That's life! January 2011 - oh how she has grown! Everyone loves a hooded towel! Must have's and 5 months! 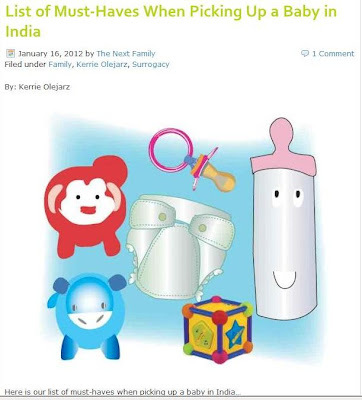 This week I decided to post our list of must haves for baby pick up in India. For those of you who have picked up you baby, I would ask you to add to the list in the comments section of my Next Family blog. Sharing our experiences really helps others, I hear this everyday!! Now, onto Cailyn. She is 5 months old tomorrow (the baby ticker at the top of the blog page seems to calculate based on 30 days in a month..) I cannot believe she is already 5 months!! Where does the time go! She can sit up on her own for short periods of time and tries hard with her little abdomen muscles to pull herself up from the lying down position. She loves her hands and feet and now reaches out to grab things...like daddy's burrito! She sleeps very well through the night, thank god, and now has a two hour nap in the late afternoon (another YAY for mommy). We do to Body Morph everyday and Cailynis a very popular girl there. As all of us women jiggle our way to a thinner self, Cailyn smiles and entertains all of us. She loves to see everyone jiggling, especially mommy! Speaking of Body Morph, my first month doing it proved to be successful...a total of 8 inches lost!! Her reflux is still a small beast and we are working to keep her comfortable. Saturday she started getting back to normal, still spitting up like crazy but seemingly in less pain. We are hesitant to use Zantac, but may get the script for the acute attacks. We have always made a "concoction" for her of warm water, flax oil and some added gas relief (like Oval or Coxcyntal). She loves to drink this, and I think she knows it helps her gas pains. We are continuing with the new formula with hopes it also helps...so far it seems to have improve things..fingers crossed. Fortunately, through all of this, she continues to sleep through the night for 10-11 hours, which helps keep us sane! Everyday with her is a joy, and even the challenging moments are looked back on as such a privledge in our life. Little girl in what seems a large high chair! Tonight as I write this Cailyn is soundly sleeping, more than likely exhausted from the last day of pain and crying. It is awful to be a parent and not be able to fix what is wrong..immediately. Sadly with reflux or colic it becomes a trial and error scenario that takes time to figure out. Hopefully tomorrow will be a better day for all of us! Well, Cailyn is rounding out the last days of her fourth month. She continues to be beyond happy, smiling and engaging with people all the time! It is really nice to see her interact in such a fun and social way. As of today Cailyn has found her "squeal" voice...she squeals high pitched, at intervals of...well alot!! It is too cute and as annoying as it could be to some, for us, it is a squeal that melts our hearts. Cailyn also has a boisterous giggle type laugh, and tries to talk alot. She continues to say "hi!" and it's not just mom and dad who have heard it. 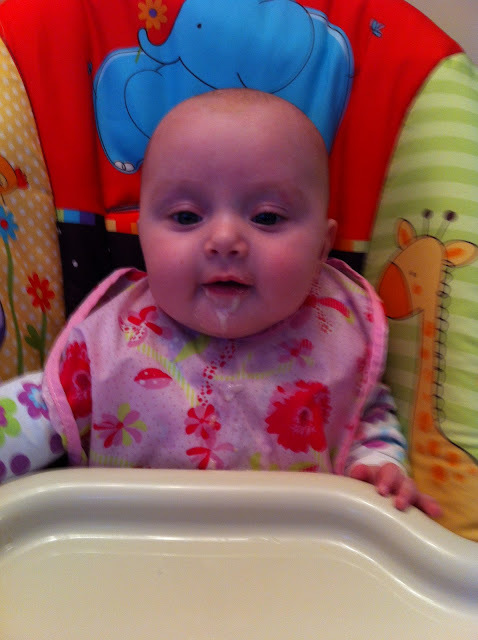 Cailyn continues to spit up what seems to be all she eats. The doctor is not worried as she continues to put on wait and is growing nicely. We are considering switching formulas next to see if this helps at all, as it seems it has progressed into reflux. For now, until we use up the rest of the purchased formula, we are giving her Bio Gaia probiotic drops and after 4 days we have noticed a substantial improvement! We are starting to see a shimmer of hair on her head - she has been bald since all her birth hair fell. I cannot remember who gave us the pink moccasin style slippers, but whomever did THANK YOU!! They are just so great!! Seems there are no socks for this age/size and the slipper are perfect! Cailyn loves to be bare foot, but once we feel her feet getting cool, we put on the slippers and all is good. Cailyn can almost sit up from a laying down postion, can sit unsupported in the tripod position and loves to lift her legs up over her belly with her legs stretched as straight as can be! She surprises us daily with new things she does and sounds she makes. Every day is a blessing with her, and every day we are so full of love and also so very thankful to Dr S @ SCI! 10/10/2011 - look how tiny she is compared to the pic above...oh how quickly they grow! 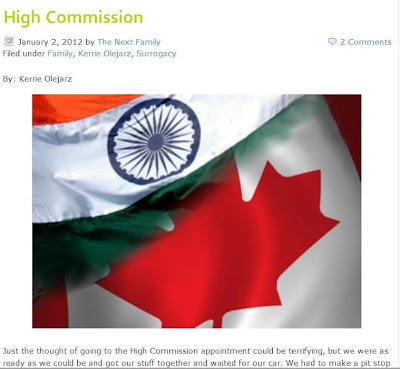 This week I detail our first visit to Consular Services. The process is quite simple, just takes time. Be prepared to stay for 3.5-4 weeks after you receive your baby(ies) birth certificate. The last week has been so super busy, with many visits, social engagements, Christmas and now New Years! Whew...the time went so quickly! Finally, this morning I can check the blogs and see what has been happening over the past week. Cailyn is teething with fury, and thank god for Boiron Camilia! Since she continues to rub her tongue on the top part of her mouth, we are pretty sure that is where the first tooth will bud. And of course, intense teething brought on a mad case of cradle cap (YUCK!). We happened to visit our naturopath yesterday who gave us some cream to try - one that will help manage any inflammation as well. We received many lovely photo Christmas cards from our surrogacy friends around the world and these will definitely go in Cailyn's 2011 memory box!! 2011 was a wonderful year for us in the Olejarz household and we are so looking forward to 2012 with Cailyn! Look up, look way up and I'll call Rusty! First gift ever from Bobcia. Uncle Stan gave Cailyn a Jolly Jumper! So much fun! Bumbo'ing in her Merry Christmas onsie. Lala - the original Teletubbies doll I bought in 1997 (for our first baby)...Cailyn LOVES Teletubbies! Adorable top from Australia!! So cute! Action shot in the Jolly Jumper!